But the Indianapolis Colts' Adam Vinatieri isn't just any kicker. First-year head coach Frank Reich started Monday's conference call with an update on Vinatieri, who is nursing a sore right groin and underwent a magnetic imaging resonance exam earlier in the day. Reich wasn't specific about the diagnosis, but said the NFL's oldest player at 45 would be monitored through the week and kickers would be brought in for tryouts in case he can't play Sunday at Oakland. Vinatieri, who is five points shy of surpassing Morten Andersen (2,544) to become the NFL's all-time leading scorer, missed two extra points in Sunday's 37-5 home win over Buffalo. And he looked shaky on two other PATs as well as a 36-yard field goal that didn't have the normal length for such an established specialist who has converted from 50-plus yards this season. "We don't know. We don't know," Reich repeated, when asked Vinatieri's status. "We just know that he felt a little something on the first PAT. So, we are just going to see how the week progresses. "Just to anticipate the question, we're going to bring in some kickers just so you guys know. But we are not going to make any decisions until later, but we are going to work some kickers out and then just see how the week plays out." 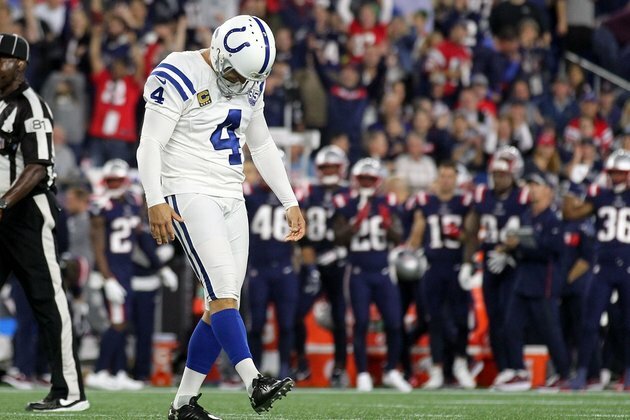 Vinatieri has made 12 of 14 field goals with a long of 54 yards in his 23rd season. Last month, he surpassed Andersen (565) to become the NFL's career leader in field goals, a record he has since increased to 571. "Ultimately at the end of the day, when you've got a guy like Adam who's just so unique, we are going to listen to him," Reich said. "We are going to listen to the trainers and that will be what will inform our decision as the week goes on." Vinatieri was on the team's injury report in Week 5 with the same injury. The Colts are one week away from a welcomed bye-week that would allow the kicker more time to heal. "I thought he was just like a robot," Reich said. "He's a machine. But the good thing is he has that mental toughness, that mindset to do what he has done in his career. You know he has the right mindset to get past this -- whatever course it should take." Vinatieri was re-signed in the offseason to a one-year, $3.625 million contract. The Colts (2-5) snapped a four-game losing streak against the offensively inept Bills (2-5), who turned to 35-year-old journeyman quarterback Derek Anderson to try to spark the NFL's worst offense. It didn't work. Anderson was intercepted three times and had one of the Bills' two lost fumbles. The triumph stood out for several reasons -- including the first NFL game to finish with that score. The Colts rushed for 220 yards, the first time that's happened since 2011. The 32-point margin of victory was the Colts' largest since 2013. And the Colts defense coming up with five turnovers marked the first time that's happened since 2008. In both of the Colts' wins this season -- the other 21-9 at Washington in Week 2 -- the opponent failed to score a touchdown. That's somewhat surprising considering the Colts entered Sunday with the 30th-ranked defense in points allowed at 30 per game. Although they've lost their share of close games, the Colts can point to several positives after finally winning again. Quarterback Andrew Luck wasn't sacked for a second consecutive game. Running back Marlon Mack rushed for a career-high 126 yards with rushing and receiving touchdowns. A pass rush that has one of the league's lowest blitz percentages still gets steady pressure on the pocket, which included two sacks against the Bills to improve the season total to 21, which is tied for fourth. The Colts had just 25 sacks last season. "We can see progress," Reich said, "but we need to see it in wins and losses." --QB Luck had four TD passes, which extended the NFL's longest active streak of throwing at least one scoring pass to 30, which ties Dan Marino, Ben Roethlisberger and Matt Ryan for eighth on the all-time list. Luck has had three or more touchdown passes in four consecutive games. --LB Darius Leonard bumped his NFL-leading tackle total to 79 with 17 on Sunday. --DE Margus Hunt had his 10th tackle for loss, which is second in the league. --DE Jabaal Sheard earned his fourth sack, which ties Leonard and Hunt for the team lead. Rookie defensive end Kemoko Turay notched his third. --RB Mack's first 100-yard game in the NFL also added the second-year back to a select list. Just two other players have rushed for 100 yards in Luck's 77 career regular-season starts -- Frank Gore twice and Vick Ballard. --WR T.Y. Hilton returned from a two-game absence to catch two touchdown passes despite nursing a sore hamstring. --TE Erik Swoope caught a touchdown pass for the third consecutive game. Teammate Eric Ebron leads all NFL tight ends with six TD receptions. --S Mike Mitchell, signed off the street two weeks ago, had seven tackles (all solos) with one interception, two passes defended and one forced fumble.